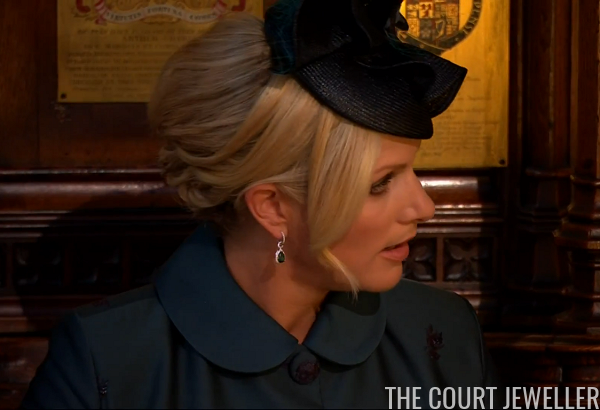 The Windsors showed up in droves today at St. George's Chapel to watch the Duke and Duchess of Sussex exchange vows and rings. 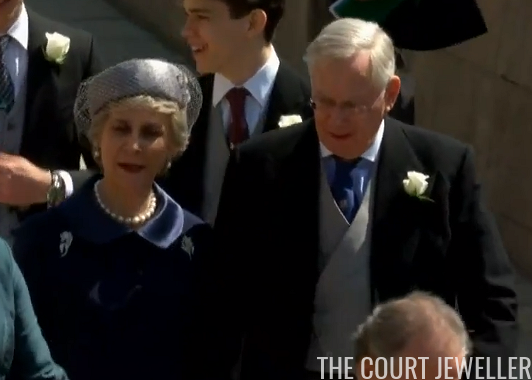 Here's a look at the jewels that the royals wore for the big celebration! 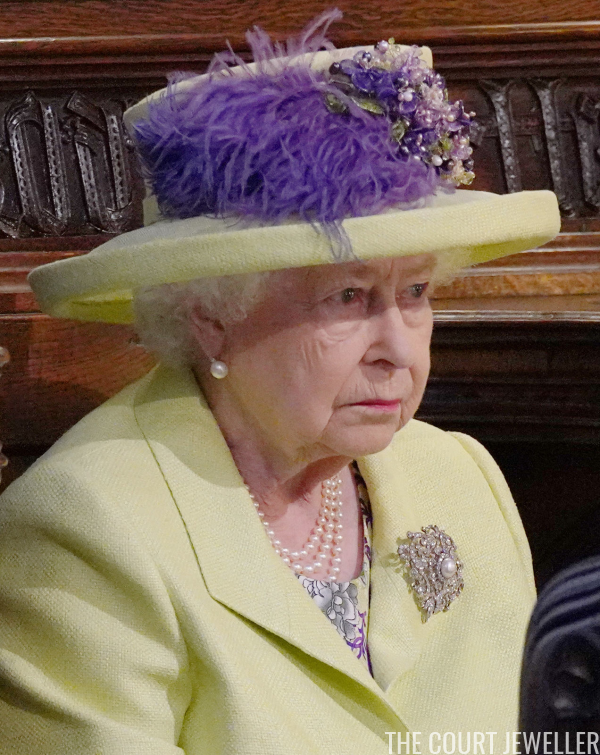 The Queen wore her usual daytime pearl necklace and earrings with one of the grandest brooches in her collection: Queen Mary's Richmond Brooch. 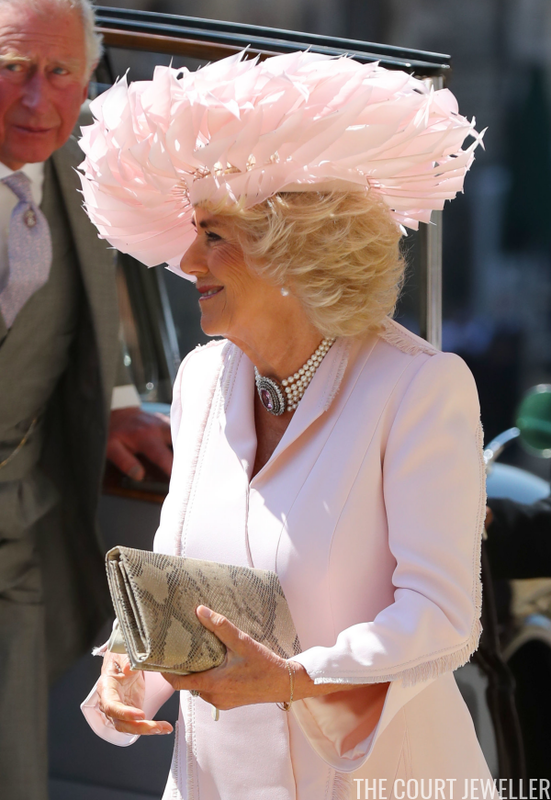 The Duchess of Cornwall picked her most impressive daytime necklace: the five-stranded pearl choker with the large pink topaz and diamond clasp. She paired it with her usual daytime pearl drop earrings. I don't know the particulars on these earrings yet, but I do know Kiki McDonough when I see it! 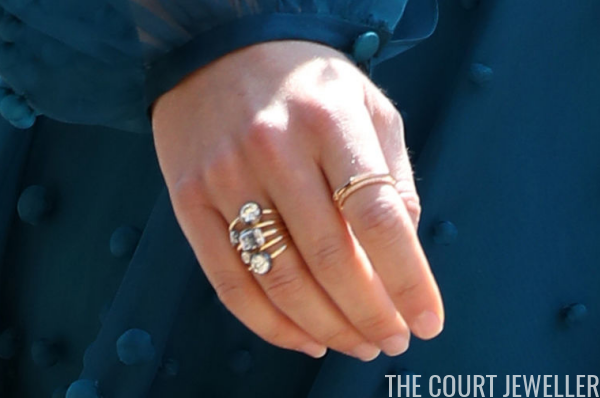 The Duchess of Cambridge was also wearing a large ring on her right hand. I don't have details yet on this one, either. Will update if I get them! 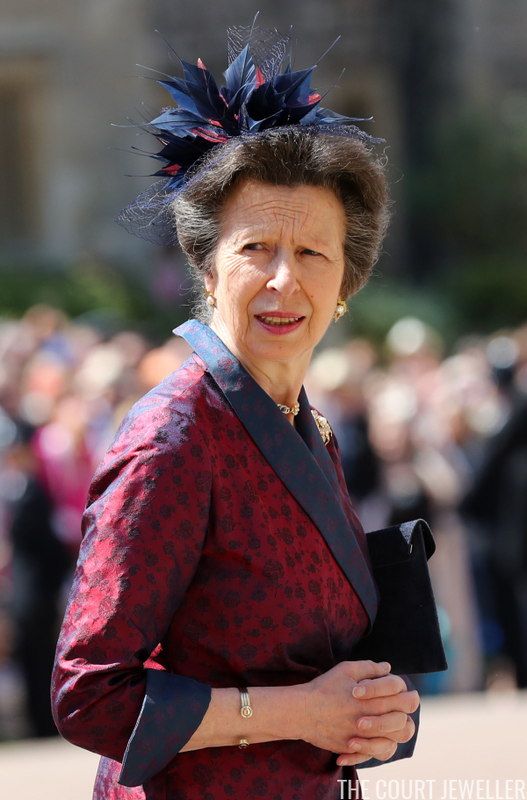 The Princess Royal wore her gold and pearl earrings, one of her seed pearl necklaces, and a gold bangle on the day. 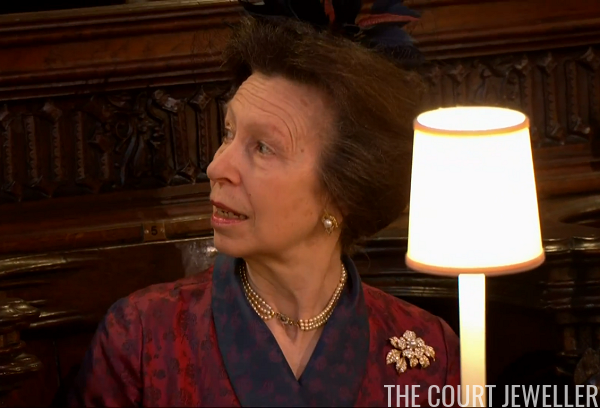 Here's another view that shows Anne's earrings, necklace, and golden floral brooch. 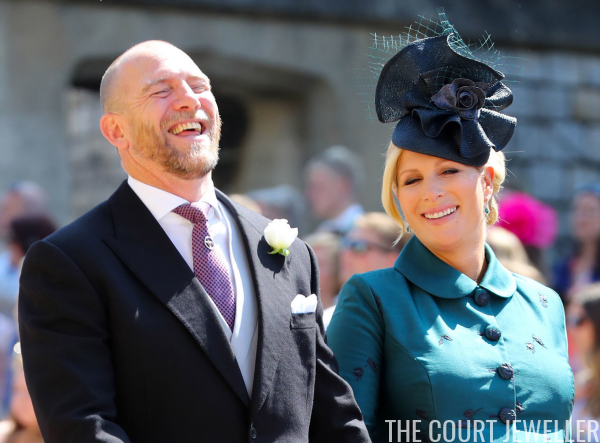 Anne's daughter, Zara Tindall, wore a pair of earrings with green drops that matched her coat. Zara and Mike are expecting their second child within a matter of weeks. 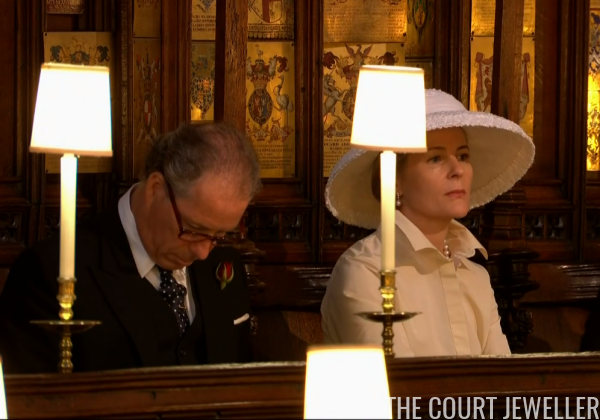 Here's another view of the earrings from inside the chapel. 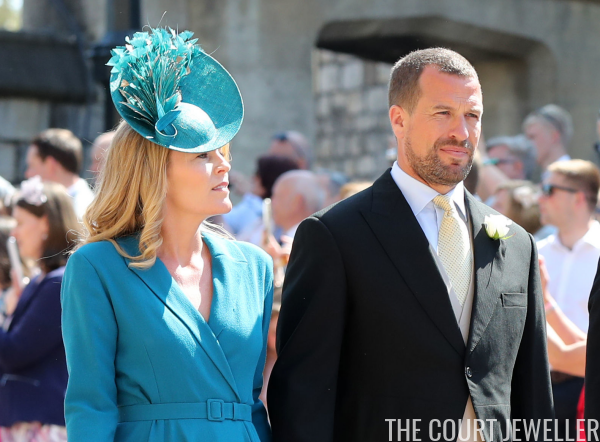 Autumn Phillips's earrings were obscured by her hair and her elegant hat. 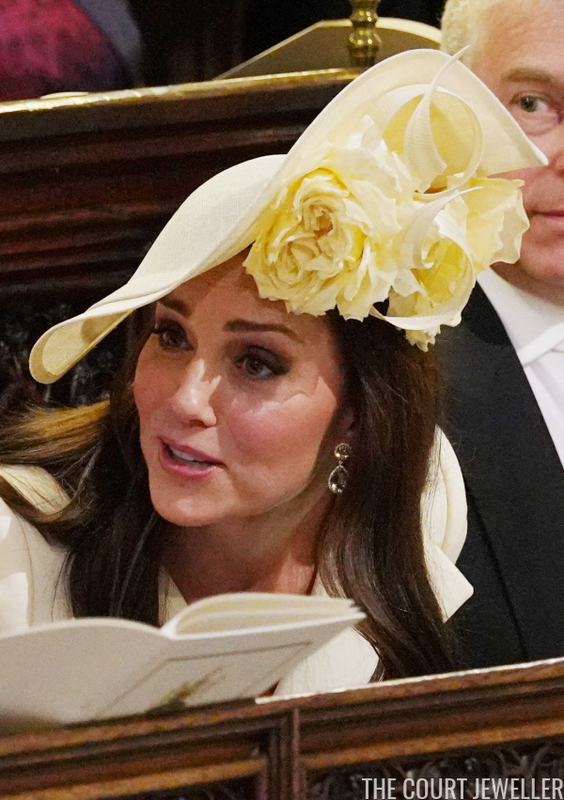 We got just the briefest glimpse of an accessory when she adjusted her hat inside the chapel. 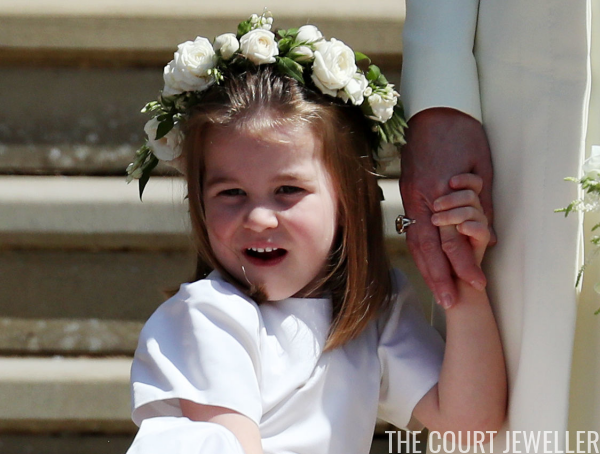 Beatrice's major accessories for the day were rings on both hands. Here's a better look at the rings on her right hand. 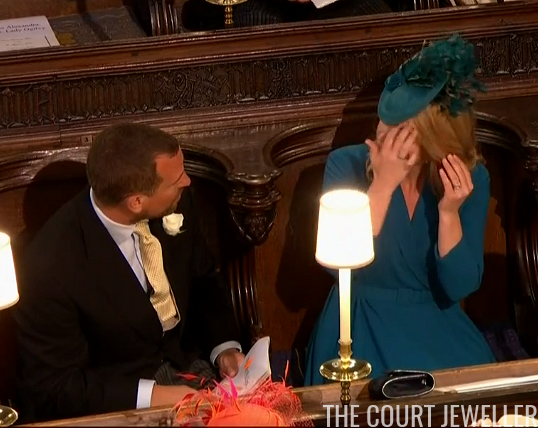 Eugenie also eschewed earrings for the wedding day. But her engagement ring was on display! 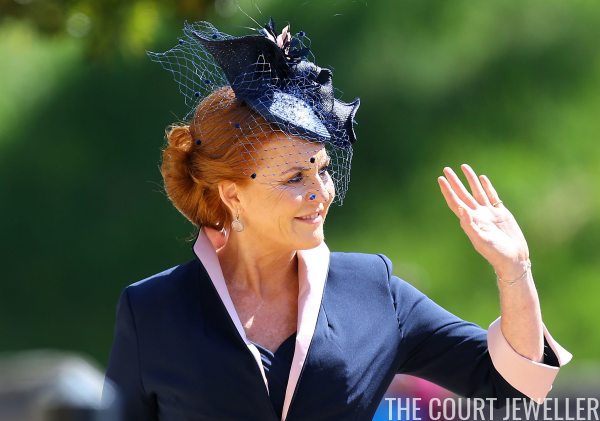 Sarah, Duchess of York wore earrings with pale pink drops to coordinate with her outfit. 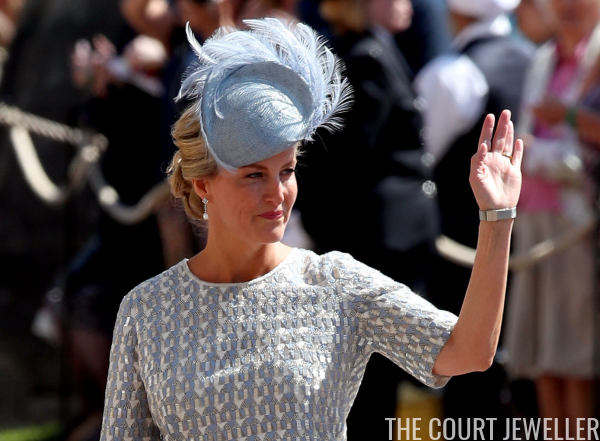 The Countess of Wessex was effortlessly elegant in diamond and pearl drop earrings. 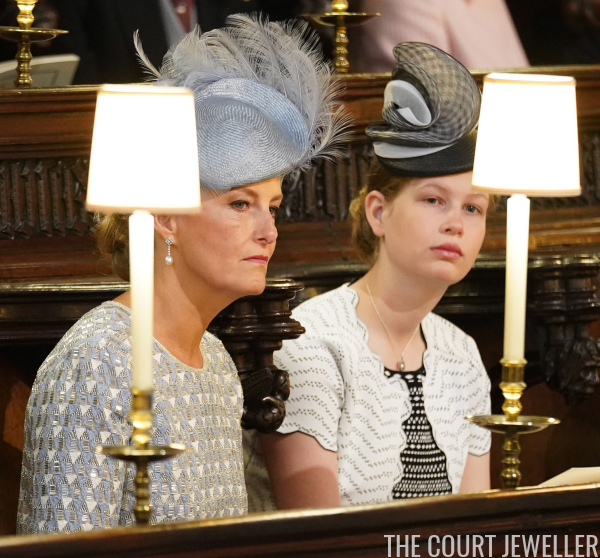 Her daughter, Lady Louise, wore a lovely pendant necklace. 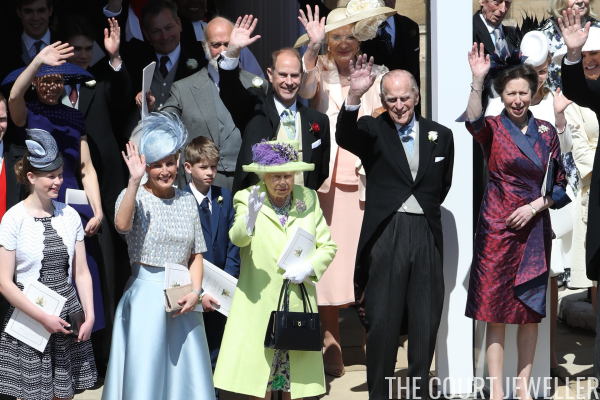 The wedding was also attended by several members of the extended family. The Countess of Snowdon, daughter-in-law of Princess Margaret, wore her customary pearls. 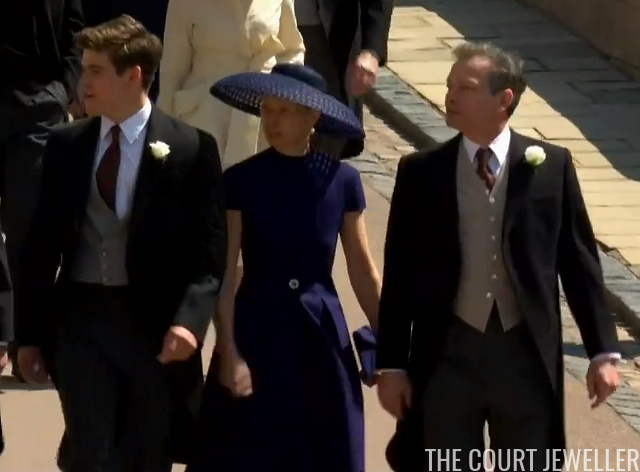 Lady Sarah Chatto, who is one of Harry's godparents, was also there, looking lovely in blue. Her major accessory were her earrings: the diamond and pearl drop earrings that she wore on her own wedding day. The earrings once belonged to her mother, the late Princess Margaret. I'm not sure if the bit of bling on her belt is a jewel or a part of the garment. 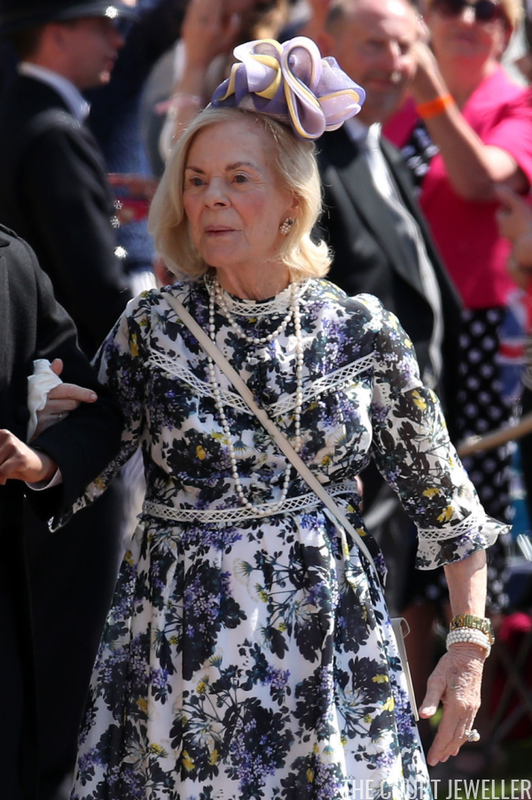 The Duchess of Gloucester wore pearls and a pair of diamond floral brooches. ...and so did her sister-in-law, Princess Alexandra. 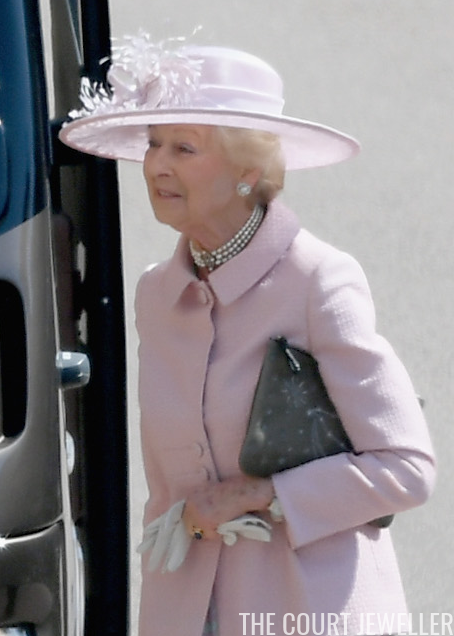 Princess Michael of Kent was thankfully appropriate with her jewelry choices, wearing jewelry made of coral and seed pearls.